Having a weather station located at your stock site makes good sense. The data your weather station collects can give a good indication of the current and past state of heat load at your site. Combine this with your site specific forecast and you now have a valuable tool to manage heat stress within your operation. Join the HLDN – Simply complete the form on this webpage below. The Katestone CHLT Team will then contact you for information required to ensure that your current weather station is suitable. 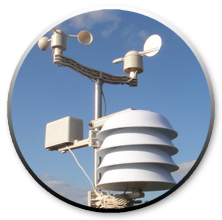 Weather Station connected – Katestone will provide guidance to get your weather station data uploading to our secure site. Process complete – now you can start enjoying easy access to your site specific HLI and AHLU through the CHLT web site and an improved forecast for those days when there is a heat load carried into the next day. I'd like to connect my weather station to the Heat Load Data Network. I'd like more information on available weather stations. I have other questions I'd like answered, please get in touch.